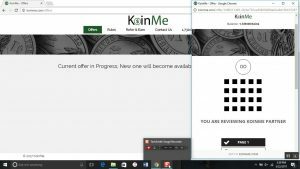 KoinMe is one of the more passive video watching sites I have used. It is easy to set up and keep going. It doesn’t require being the main page up so you can work on other things and let it run its course. It doesn’t have breaks or stop until their are no more Koins to earn for the day. It has a daily limit, so once that is reached, you can close the browser and give your computer a little break, or put it to use doing something else. You begin by selecting one of the available offers. It will pop up a screen showing the video is about to play. A second screen will pop up that starts playing the videos. Once each series of videos plays, the koins are awarded.